Genesis 1:26 “Let Us make man in Our image, according to Our likeness" Adam and Eve were created by God, for God and in His image, a reflection of Him. What does this mean exactly? The term ‘image’ is a duplicate of an object formed by a lens or mirror. The Hebrew word for ‘image’ (tselem) is the same now as it was 2,000 years ago. It is used when referring to taking a photograph. It describes the outward appearance. The ‘likeness’ on the other hand, refers to the inner being. We received the inward form of God….whoah! What this means is that the Triune God created a Triune man: spirit, soul and body. This is also why, when God was made flesh, he was in the form of a male human being. We were created in his image so it makes sense that when He came He would come as man. They were such an accurate representation of God that, if we use the mirror illustration, if Adam had been able to look in a mirror he would have seen the face of God looking back at him. As such Adam & Eve, as the human ‘likeness’ of God, became the created Glory of God. The Glory of God is the image of God. The image of God is the Glory of God. As God's creation man became the perfect and sinless Glory of God. It goes on to say in Gen 1:27-28 that God not only created man in His image, a likeness of the essence of God, He then blessed them and instructed them to “be fruitful and multiply” and “fill all the earth and subdue it”. He then gave them complete authority, or rulership, over “every living thing on the earth”. What did we do with it? Threw it away, right? We were the actual Glory of God and we threw it all away! Turn to Romans 2:22-23 please. It says, "Professing to be wise, they became fools, and exchanged the glory of the incorruptible God for an image in the form of corruptible man..." I believe that this passage, more than any other describes not only exactly what happened in the Garden, but also told us 2,000 years ago how we would behave today – outside the Glory of God. By disobedience to God (partaking of the tree of knowledge) man, acting on pride, exchanged the Glory of God for the image of man. Man traded his place as God's created Glory, because of his own selfish pride, and replaced it with the image of man. There, in that moment of tasting the forbidden fruit, we gave up on God and by way of sinful “knowledge” turned to ourselves for the answers to everything. This is exactly why we worship 'man idols' today - celebrities, sports figures, musicians, politicians – I’ve even seen Pastors and worship leaders worshipped more than God in some settings. When Francis Chan, the founding Pastor of Cornerstone Church in California , left that church in 2010, he stated that when he started hearing his name mentioned more than God that it was time to leave. He’s now planting churches in the inner city of San Francisco and enjoying surrendering himself fully to what God has for him. A lot of Pastors are still shaking their heads over that one. So, we turned out backs on God, we quit God. But He never quit us. That’s how much He loves us. Getting back to Genesis 1:27, what did God intend that we were to “fill all the earth” with? His Glory! What does that mean? Well, if we skip ahead to Matthew 6:9-13, Christ gives us the Lord ’s Prayer. I believe that the Lord’s Prayer isn’t simply a model for prayer but also a model for how we, as Christians, are to be living here on earth – and I believe it is what He meant for Adam and Eve to accomplish as well. It is our job to call down the kingdom of heaven on earth that all living things should be filled with His Glory - “on earth as it is in heaven!” This would be a real good place for an Amen! Because we gave up the Glory of God, exchanging it for the image of man, We no longer possessed the Glory. As judgment on Adam’s transgression, we no longer have the Glory living and breathing inside us. This is why, throughout the Old Testament covenants, God began to manifest Himself to us to remind us of who He is and what our mission here on earth was supposed to be. Jesus, as caretaker of the Glory, manifests Himself in various ways – miracles, visions and actually appearing physically to some, like Moses, Isaac and Solomon. This passage speaks not only to one type of manifestation of the Glory, but also to the power of the manifestation of God. His presence, His Glory, was so powerful that Moses couldn’t even enter the tabernacle! Hopefully we have all experienced this power in times of worship, prayer or visitation. An example of this power is what is commonly called ‘being slain in the Spirit’ where the power of God literally sweeps us off our feet. Now, I’ve had people ask me what the purpose of being slain in the Spirit is - and it’s two-fold really. One purpose is to remind us that He is still on His throne and still in control of everything! That He can show up at any time, any place and make His presence known – God is large and in charge! Do you see Jesus in this, even though it says this was God speaking to Moses? Jump to John 8:54-58. Here Jesus not only speaks regarding the Glory and the fact that He sought only to Glorify the Father, He also confirms that it was He that spoke to Moses as the great I AM. Again, emphasizes the Glorification of God the Father and instructs us that when we pray if what we ask for glorifies the Father, and if we ask it in Jesus name, He will do anything we ask! It is important to understand the ministry of the Holy Spirit and how He fits into things. If you look at Genesis 1, God begins straight off the bat by establishing the Trinity, then introducing the Holy Spirit, then Jesus. Now look at verse 14. It says “And the Word became flesh, and dwelt among us, and we saw His glory, glory as of the only begotten from the Father, full of grace and truth.” Which person of the Trinity became flesh? Jesus. So this verse establishes Jesus as the Word. Now go back to Gen 1 and read it again with the proper names filled in. Now do you see it? Right off the bat God tells us that Jesus, the Holy Spirit and the Father are all working together – at all times! This is always the situation throughout the workings of God. As I said, the first person of the Trinity that we’re introduced to is the Holy Spirit and the second is Jesus, right? Who do we meet first at salvation? The Holy Spirit. It is the Holy Spirit that convicts us and in turn introduces us to Jesus as our savior. 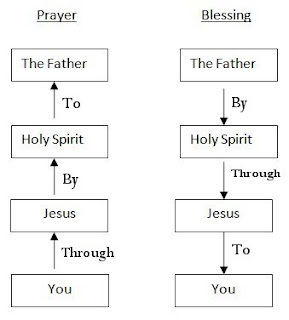 This pattern of the persons of the Trinity working together also works the same in the model for succesful prayer. This is a verticle relationship. Our prayers go up and the blessings come down. One other thing is this. We must acknowledge both Christ and the Holy Spirit in the church. While Christ is Lord over the church, the Holy Spirit is Lord in the church. This is one of the major issues facing the church today. While all true Christian churches acknowledge Christ as Lord over the church, not all acknowledge the Holy Spirit in the church, Amen? Without the Holy Spirit in the picture, we can have all the right doctrine and say all the right words, but our prayers never go any higher than the ceiling of the church! Those prayers never reach the Father, who is the ‘say-soer’. 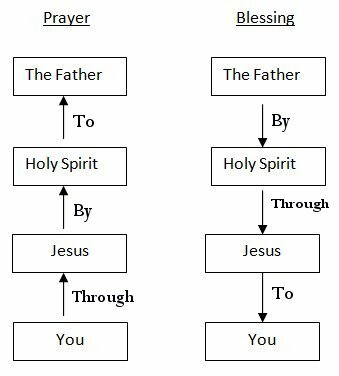 What I mean by that is that our prayers go through Jesus, by way of the Holy Spirit, to the Father. The Father has the ‘say-so’ over what is answered in the positive. Have you ever heard someone say “God never answers my prayers” This is the case for one of two reasons, or both. Either the person doing the praying hasn’t acknowledged the Holy Spirit or the Father truly answer ‘no’. You see, the Holy Spirit is key in everything. This is why Jesus commanded His disciples to wait in Jerusalem (Acts 1:4) for what the Father promised, the Holy Spirit. It is also why Jesus told His disciples that they were better off without Him being there, when it was time for Him to go to the Father (Matthew 16:7-8). He knew that without the Holy Spirit active in their lives they could not carry out their missions. The Holy Spirit also plays a very active part in the manifestation of the Glory. The way to make friends with the Holy Spirit is to glorify Jesus, praise Him, worship Him and the Holy Spirit will come! Have you ever prayed over someone and had them get slain for the first time? Did you feel anything, any power surging through you at the time? No. This is the same as praying over someone for healing, or leading someone through deliverance. Usually we don’t ‘feel’ anything at all. When God first blessed me with healing, I used to get all tingly and warm in my hands, but I think that was just to let me know that He was working through me because it rarely happens any more like it did then. I remember the first time God healed someone of cancer through me – and I felt nothing at all physically but received a direct download within a few hours, after praying for it, that the woman, a very well known Christian disc-jockey had been completely healed of pancreatic cancer – and she had been given just a couple of months to live. The next day she went in for a scheduled PET scan and the tumor was completely gone – Praise Him! But I ‘felt’ nothing. Again, God does this just to let us know that we have nothing to do with it, that He is in charge. And even though the Holy Spirit resides in each of us at salvation, He isn’t activated until we receive the second baptism, what John called the baptism in fire – the Holy Spirit. John so much as called this baptism the baptism in Christ. It is with this second baptism that the Holy Spirit is activated in us. This is when He bestows certain gifts on us…as taste of the Glory that we relinquished upon yielding to sin and disobedience. We, as Christians, are to constantly be taking action, calling down the Kingdom of God, the Glory, here on earth! We also are to be listening to His voice and following what He gives us. We must become like the RCA motto, “His Master’s voice”. When He speaks we need to hop to and carry out what He has given us to do. If you don’t you’ll never realize everything He has for you. When God gave Abraham the covenant and made circumcision it’s sign, Abraham didn’t doddle, sitting around thinking about it for days before doing what God commanded him to do. He took immediate action, circumcising himself and his entire household, including the servants, in one day! I am here today for this very reason. The bottom line is that I knew that if I didn’t step out when I heard the voice of the Lord, I would never experience everything He has for me – and I want everything He has for me. An itinerant missionary friend of mine, Alan Bender, received his marching orders from God in 2007. At the time he was a very successful executive with a major company. The next day he walked in and quit His very well paying job. Alan just visited His 46th country doing the work that God had planned for Him. He’s just went to go to India with the guy who produced the “Dead Raisers” movie, to raise the dead. He has seen great miracles of all kinds in the last seven years – but He wouldn’t have experienced any of that if he hadn’t followed God’s voice and took that first step out. These are all ways that God demonstrates His Glory to us today – through Spiritual gifts, miracles and speaking to us, guiding us back to the Glory…allowing us to glimpse the Glory. Did you ever stop to think of why you’re still here on earth? Why didn’t God just zap you up to heaven when you were saved? The only reason we’re here is to finish the task that God started with Adam – to call down the Glory of heaven on earth – as it is in heaven. This is the only reason for us being here, this and to lead others into the walk to serve the same purpose. So, after the fall, God took away our dominion over the earth and gave it to Satan. Ever since, our natural state is that of sin. We are born into it and live in its death grip as a natural result of disobedience against God. Adam and Eve, in their disobedience, unwittingly sentenced us all to a state of enslavement. But it is imperative to understand that this was of our own choosing, as man. We chose to follow our own urges of pride and arrogance over God. The same applies when we stand before God and answer for ourselves. He doesn’t send us to hell – we have already sentenced ourselves to hell by our own choice and our own actions. The fall also marked the beginning of the need for the deliverance ministry, for it was then that demons were released to torment us. So, by being disobedient to God not only do we live in a natural sin-state but on top of that God allowed us to be tormented by demons in order to compound our torment. As God’s creation, we have separated ourselves into two distinct time frames and functions on earth: before the fall and after the fall. The difference is that, as we were originally created, we lived the Kingdom life here on earth, as it is in Heaven. There was no sin, there was no illness, no cancer, no heart disease; there were no demons to cast out, there was no depression, no self-pity – we had nothing to be sick or depressed about. We were God’s children, pure and perfect, living in God’s Kingdom as He created it here on earth. We lived in sinless perfection with total authority over all things. Do you realize what we gave up? This should also tell you what we have to look forward to in the Kingdom! Amen? Because we traded that perfection for corruption, God now has to make Himself known to us. He does this by way of signs and wonders, miracles, healing cancers and the plethora of diseases and curses that we have brought down on ourselves through our own disobedience. He also empowers believers that recognize Him as Lord of Lords and King of Kings to act on His behalf. In Matthew 10:1 Jesus called His 12 disciples together before sending them out and gave them two powers or authorities; to cast out demons and to heal every disease and sickness. Did He say some diseases? No, He said ALL diseases! If we call ourselves disciples then the same authority applies to us! The Lamb of God has given us His ‘Power of attorney’ to act on His behalf, to heal diseases and cast out demons of fear, unbelief, depression and doubt in order that we may enable others to see His saving light of salvation. In doing so, we get to experience a fraction of the Glory and Power that was given to Adam at the start. Luke 19:10 says “For the Son of Man has come to seek and to save that which was lost.” What was lost? The image of God in us, the Glory. Jesus is sometimes referred to as the “second Adam” in that He was pure, innocent, perfect and sinless. What makes Jesus the ‘last Adam’ is the fact that He remained pure, innocent, perfect and sinless His entire time on earth. Jesus was sent to redeem us to Glory! Jesus is the Glory of God in the flesh! Praise Him! The power of attorney that He passed on to us gives us the authority to carry out everything that He did while He was here. Are you with me? This tells us that our salvation isn’t just an individual thing, that Jesus gave His life for His church, the Body of Christ. We are the flesh of His flesh and the bone of His bone. He has made us “members” of His body – individual parts that make up the whole of His very self! In His church, His body, is where you will find the very depths of God's love, and find your place in demonstrating the most exquisite workmanship of God. In Ephesians 3:14-21, Paul prays “For this reason I bow my knees before the Father, 15 from whom every family in heaven and on earth derives its name, 16 that He would grant you, according to the riches of His glory, to be strengthened with power through His Spirit in the inner man, 17 so that Christ may dwell in your hearts through faith; and that you, being rooted and grounded in love, 18 may be able to comprehend with all the saints what is the breadth and length and height and depth, 19 and to know the love of Christ which surpasses knowledge, that you may be filled up to all the fullness of God." Here Paul prays for the church, the body, that, of all the riches of His Glory, the one thing he wishes on us is to “be strengthened with power through His Spirit in the inner man”, to have the Holy Spirit not just hang out in us but to be active in us to the core of our being – the inner man! He goes on to say that IF the Holy Spirit dwells is us it enables us to comprehend how much God loves us AND to be filled to the maximum with God’s love! So, it is the Glory that enables us to experience the fullest endowment of God’s love…wow! 1 Corinthians 15:45 “So also it is written, “The first man, Adam, became a living soul.” The last Adam (Jesus) became a life-giving spirit." Yeshua Hamashiach, the Son of God, the “anointed one” and the second (and last) Adam, was perfect and sinless and was sent that sinful man be redeemed back to the life of Glory, the very image of God. The only way we can receive redemption is by stepping out of our prideful nature and into Jesus! Then and only then can we be restored to the image of the Glory of God – but while here on earth we can only get glimpses of the completed Glory that we will experience in Heaven. Because man has stained the earth with sin, the state of perfection will only be realized when we are with the Father in heaven. So, we are to focus on Jesus and the Kingdom – “forgetting those things which are behind and reaching forward to those things which are ahead” in the Kingdom! Hebrews 12:1-2 further instructs us “Let us throw off everything that hinders and the sin that so easily entangles, and let us run with perseverance the race marked out for us. Let us fix our eyes on Jesus, the author and perfecter of our faith, who for the joy set before him endured the cross, scorning its shame, and sat down at the right hand of God." If we use the lessons of Jesus as the model of how we are to live as Christians, we have it all: salvation, water baptism, tithing, fellowship with believers, loving your neighbor as yourself, baptism in the Holy Spirit, healing the sick and casting out demons and leading others to salvation. At the heart of it all is love. God's love is the key to Glory.